Why is it when your ONLY child decides to actually share something with you … it’s a cold? I had been quietly sailing through the winter, had my flu shot like a good little girl and “wham”—sniffles, sneezing, fever and cough. The worst is actually over, but the cough is a gift that keeps on giving. I am only mentioning this to give me an excuse about any incoherent rambles I might wander off on. I haven’t had a whole lot of sleep. Today I went to school to pick up my child, totally forgetting he was lunching with his grandmother, and I could have been home taking a nap! I notice, when looking through our photos for today, that the ’70s seem to be showing up a whole lot. We always wonder where these things have been hanging out for the last four decades. I’ve gotta say that their bar had better have been super deep and had locks on the cupboard doors to let this thing hide out that long. 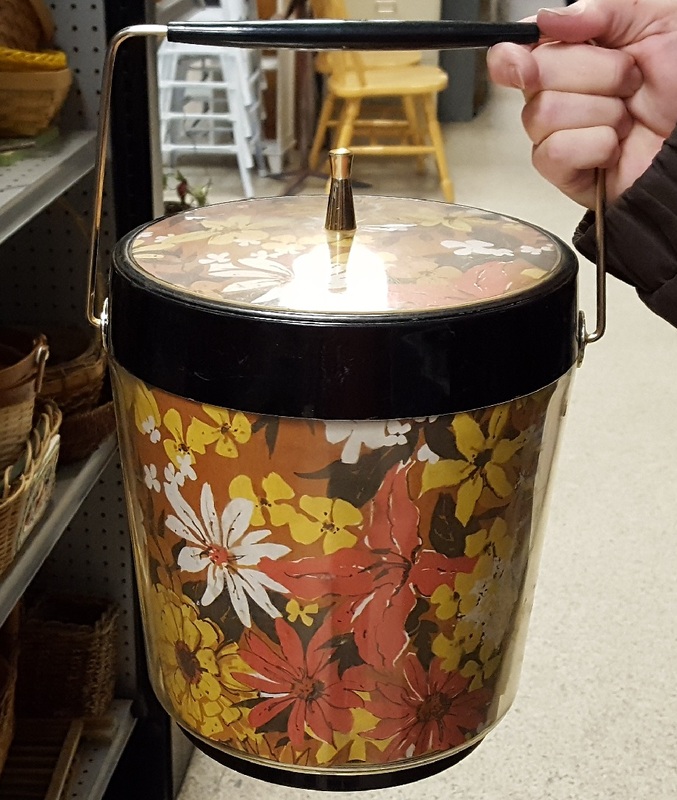 This was too square for the groovy bachelor pad, and much, much too ugly for any housewife worth her salt to set out where people could actually see it. 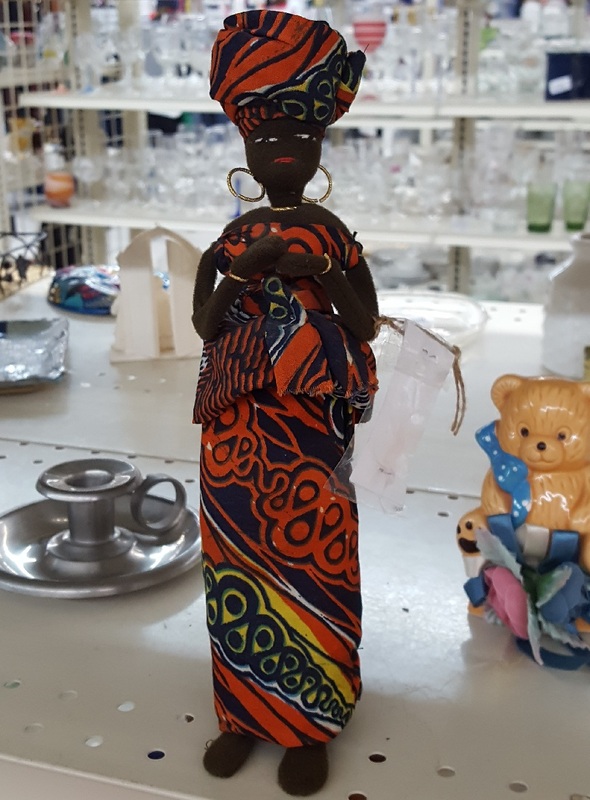 Let’s hope it was a wedding gift, and they were waiting for the donor to kick off before they sent it away to languish in the thrift store. 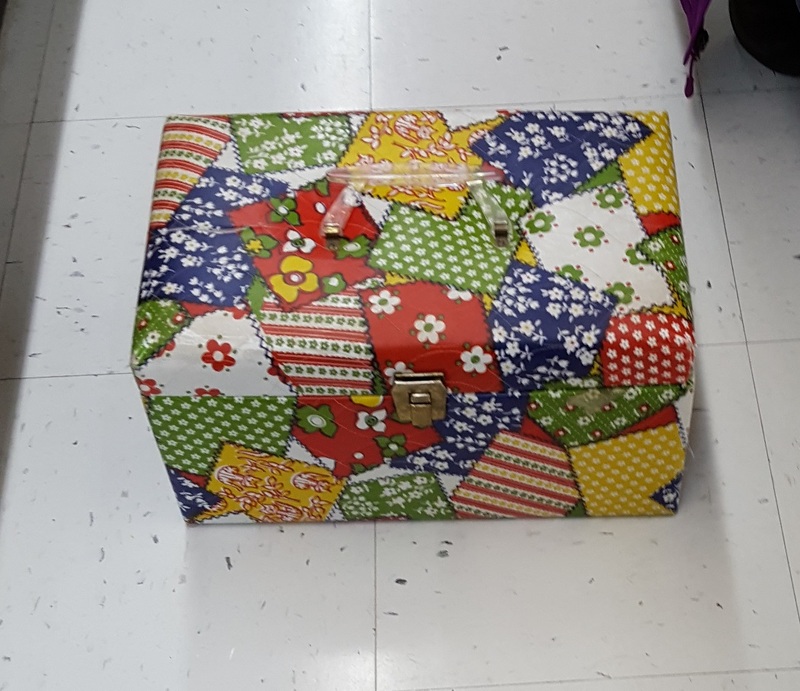 At first we thought it might have been a sewing basket, and were almost able to forgive it on the notion that it might have held cool sewing stuff. Nope, this was luggage! To be specific, a train case. I’m gonna say that this would be one piece of luggage that you could leave totally unattended and no one would look at it twice. There is no way on God’s green earth that anyone with the poor taste to carry it would have anything worth stealing in there. Heck, I bet you could carry the Hope Diamond with impunity. I just want to apologize to the poor thing. This was decorated for a wedding, and what says festive wedding more than this monstrosity of whipped wax. 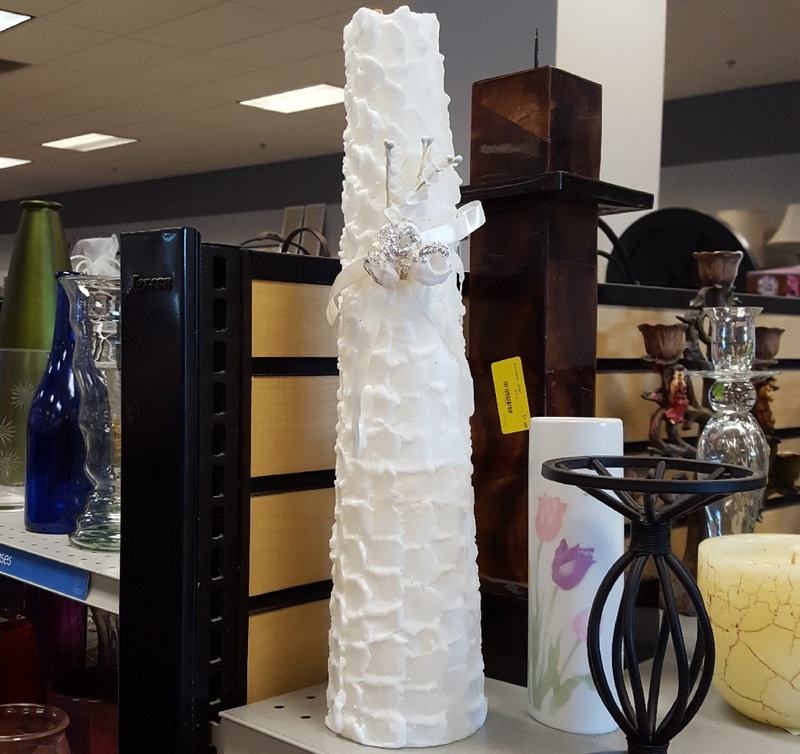 It was awfully big, and I am not sure you could manage to burn the whole thing during the length of an average reception, so please just toss it in the trash with the rest of the DIY wedding favors that should never happen. If you must give someone something for the wedding, a nice little bag of candied almonds always seemed like a nice choice. You could eat them or pass them along to someone who would nibble on them. No wondering what to do with the mini lard candles, or something even less prepossessing. On the one hand this swan looks more like a dragon than not. 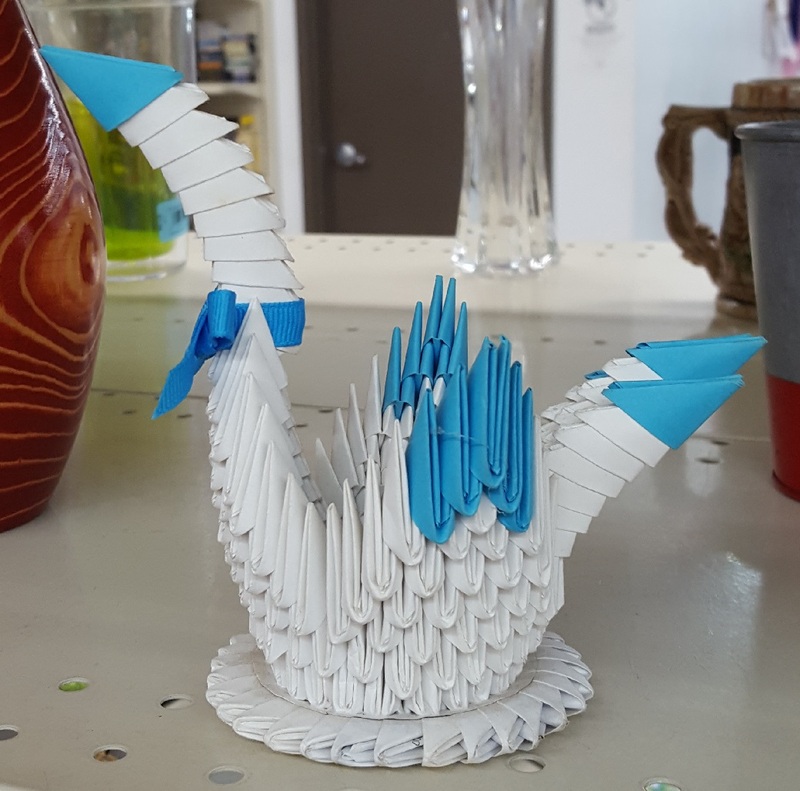 I am guessing the left hand side is the head, judging from the bow around the neck, but it is not very head-like, so really as a swan it failed, but props to the crazy person that folded that many individual pieces of paper to make this! I don’t know why they did it, but there you go. I believe we have seen something like this before, see here. At least this one didn’t have a glass bowl to go with it, and they tried to be a bit color-coordinated. Funny, we have never come across these instructions. Knock on wood, probably next week! 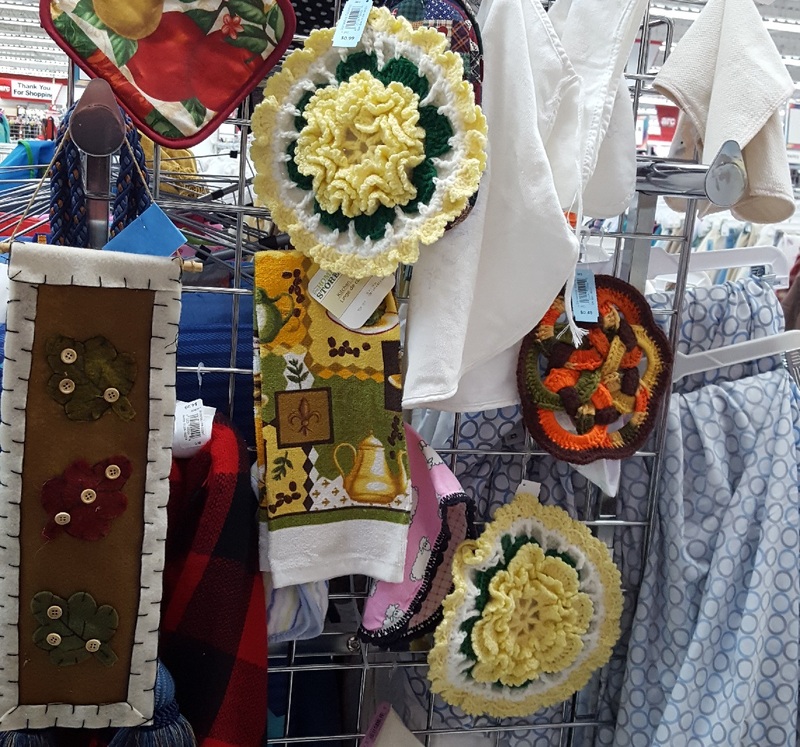 We found a whole drawerful of Grandma’s pot holders. Most of them were pretty seventies, but we each found a cute tiny older one that needed to be rescued. It’s not like we couldn’t arm an entire neighborhood in pot holders, is it? You know the answer to that is yes, but at sixty-nine cents, they needed us. 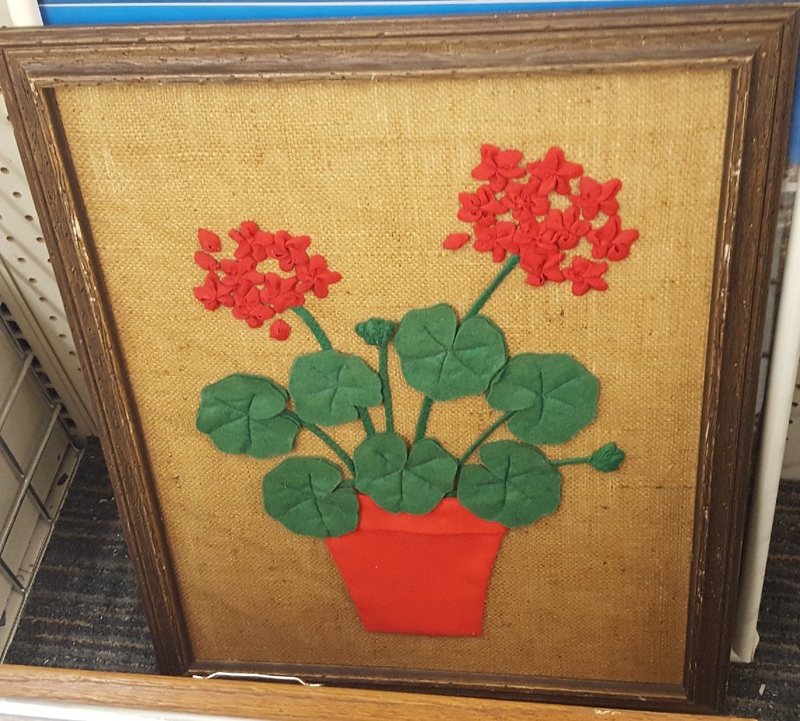 It’s your basic ’70s burlap plant picture. These were everywhere you looked back then. 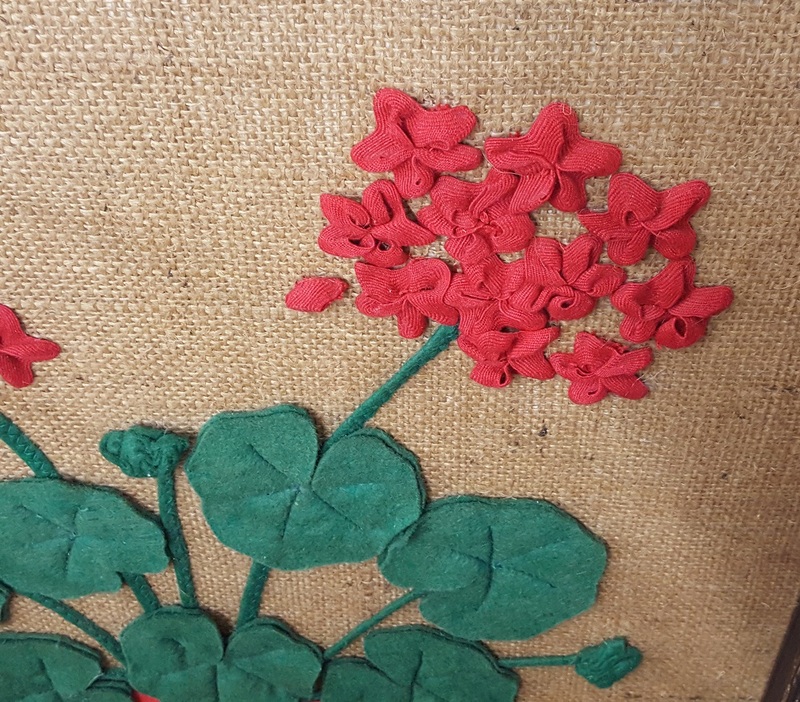 Most of them were embroidered, or commercially done, but we noticed that the actual geranium flowers were made of rickrack. How clever is that? Told you. Golden Idol, anyone? I guess it is supposed to look Egyptian, but it looks more like a prop from a zombie/mummy B movie from the ’60s. You know the kind with the really bad stop-motion animation, and actresses who seem to have gotten paid per scream? 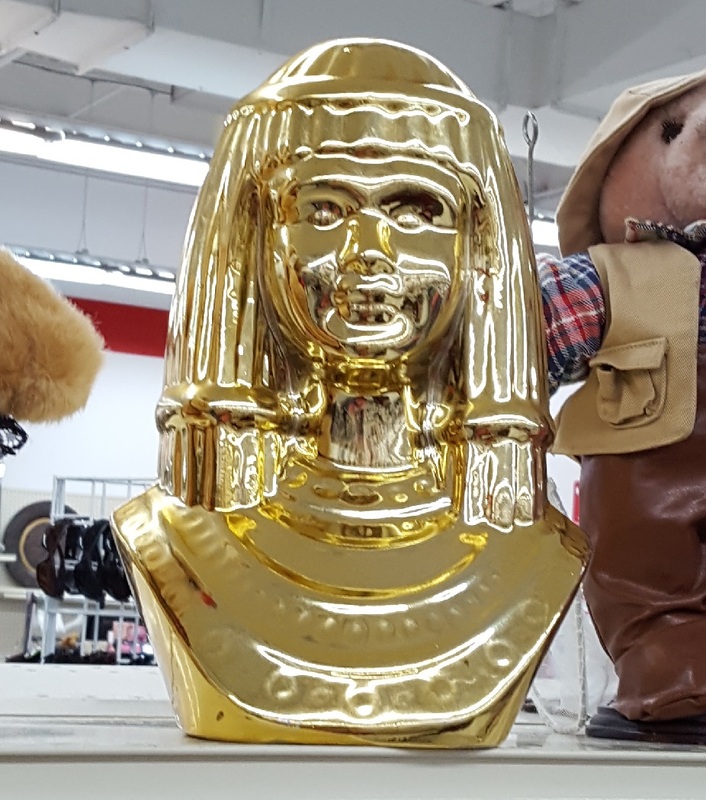 “Zombie Tut Meets Midas and Pays the Ultimate Price”! This didn’t even have the excuse of being a bank, or even anything slightly useful. Just a big gilded hunk of ceramic. 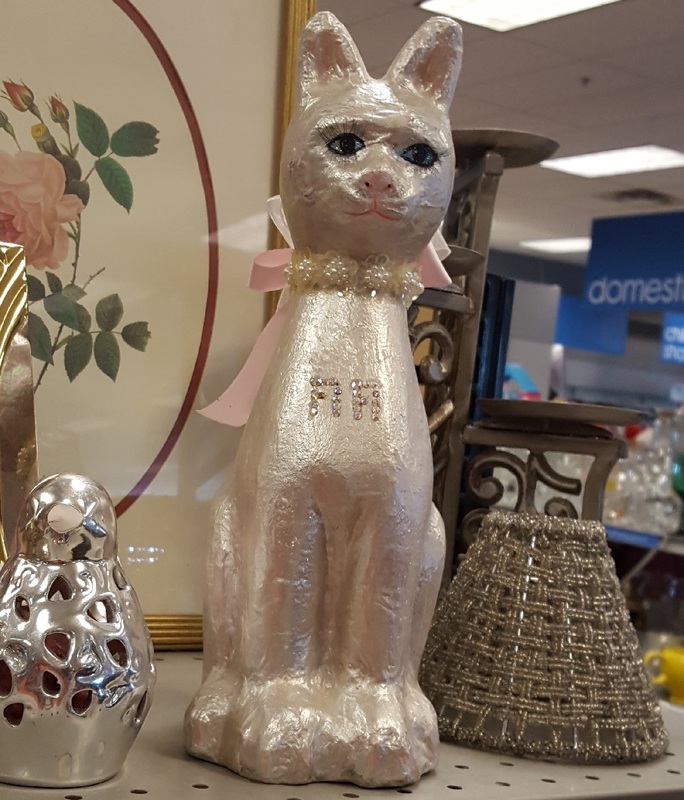 We have a category in our tags called Golden Knickknacks. Pretty sure this qualifies in spades. We thought this travel doll souvenir was just so much fun. Loved the colors of her dress and head scarf, and she had a cute look on her face. Not too big, and not breakable. The perfect keepsake to bring back. We were sorry she was there, but you can’t save them all, and we had already filled up on hot pads! 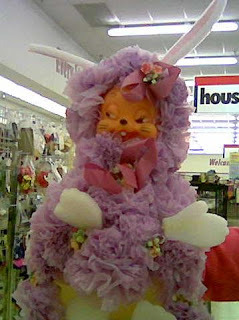 Spring is coming, so they say, and Easter is early this year, so we are gathering those bunny things to share. If you have a bad egg (or a good egg for that matter, or a bunny or two!) that you want to share, be sure and send it in. We love to hear from our readers. 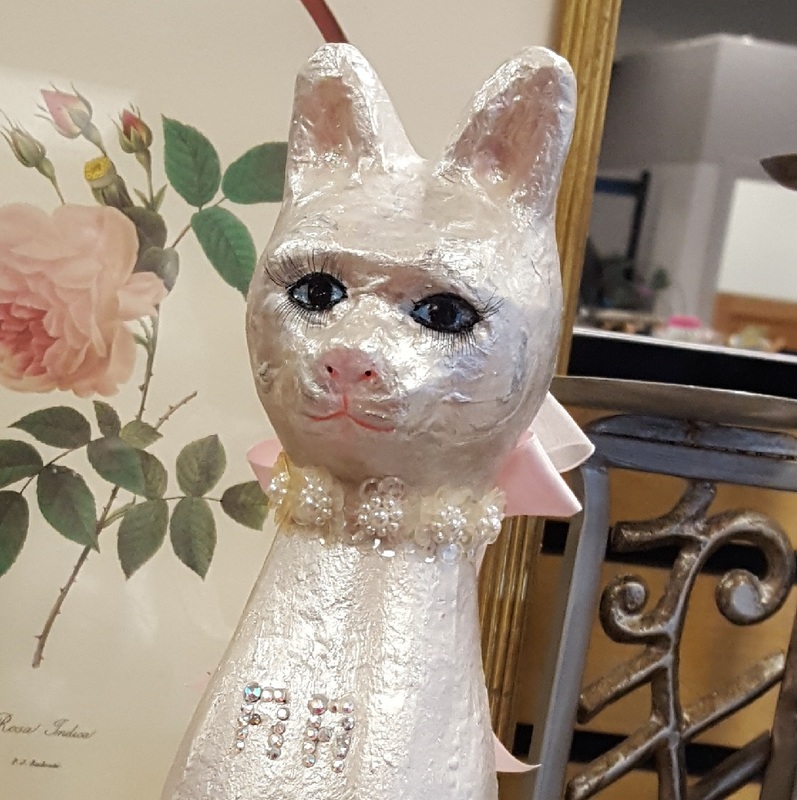 This entry was posted in Friday Finds and tagged Animals, Bad Decor, Cats, Crafts Gone Wrong, Dolls, Golden knicknacks, Kitchen items, Pictures, Thrift Store. Bookmark the permalink. Lard candle…bahahahahahaaaaa! Those will forever be known as that for me now. Heinous and now, hilarious! Thanks Dawn! We are always glad to find someone who agrees with us about the bad stuff. I’ve never liked those candles.